Pomegranates and cranberries are synonymise with holiday cuisine and aesthetics, so why not incorporate these beauties into your libation confections this season?! Not only do they taste fantastic, but both fruits also contain a myriad of health benefits…we all need that during the winter months. 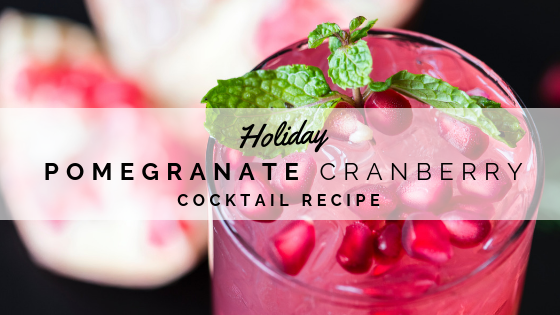 Packed full of antioxidants and nutrients, this holiday cocktail says, “I want to get you tipsy, but I also care about your health.” (Teehee) Happy holidays! Dip the rim of each cocktail glass in water and then sugar; set aside. Place 1 tablespoon pomegranate seeds and 1 teaspoon grenadine in the bottom of each glass. Add ¼ cup cranberry pomegranate juice, 1 ounce vodka, and fill remaining room with Ginger Ale. Gently stir and add a rosemary sprig to garnish. Sugar + water to garnish rims. 12 sprigs of rosemary.